Holy Trinity has a rich history of ministry and outreach to Hasbrouck Heights and the surrounding communities. The congregation was established in 1920 with the first service being held on July 18, 1920 in what was then the Baptist Chapel on the corner of Hamilton and Burton Avenues, where it remains today. In September of the same year, the Rev. Carl Zinsmeister was called to be the Pastor of the yet to be named congregation. On October 17, by unanimous decision of the parishioners, the name of Holy Trinity Lutheran Church was adopted  just in time to be formally organized on Reformation Sunday, October 31, 1920. How appropriate for Lutherans! Signators of the original charter for the Church included the Schneider, Barthold, Turner, Schroeder, Sont, Schmidt, and Ringk families. The Rev. Otto Becker was jointly called by Holy Trinity and Grace Lutheran in River Edge to serve the "yoked" parish. It was during Pastor Beckers tenure that the building was purchased from the Baptists. The Rev. Charles Schmidling arrived in 1924 followed by an expanding congregation and major renovations being made to the building, culminating with the re-dedication of the building in March of 1925. By 1927 the congregation, until this point on mission support, was able to provide full compensation for its pastor. 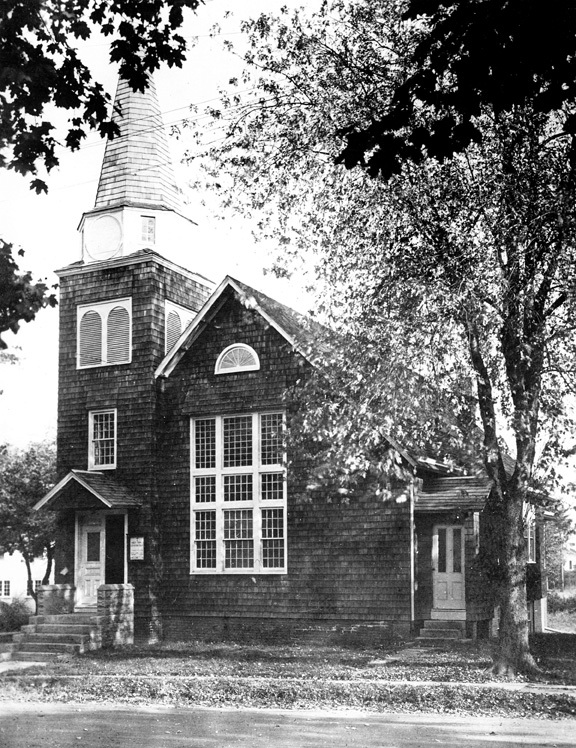 The congregation continued to grow and it was evident that they required a full time pastor, so in the spring of 1928, the yoking between the two congregations was dissolved. Pastor Schmidling remained at River Edge. May 1928 brought the Rev. Alfred Weber to Holy Trinity and the church grew to nearly 500 baptized members by 1940. Renovations to both the interior and exterior of the facility continued during these years and Holy Trinity became totally independent of all mission support by 1935. It was a time of growth  both in membership and real estate. Not only did various groups within the Church grow, but they purchased a house on the same block for a parsonage. Another change in spiritual leadership brought the Rev. William Behrens to Holy Trinity in 1942. As with everyone else in the country during World War II, the church saw some lean times. After the War, however, they experienced a boom in membership and ministries. Continuing renovations kept the congregation on its toes and the mortgage was paid off in 1945. That was the year they began the installation of specially designed stained glass windows, depicting various Bible stories, which remain a part of the sanctuary today. Pastor Behrens and one of the lay leaders, Mr. Alfred Kiefer, a well known name in Hasbrouck Heights, were deeply involved in the formation of the New Jersey Synod of the United Lutheran Church in America, a forerunner to the current Evangelical Lutheran Church in America, in 1950. In June of 1952 the Rev. Herman Meiburg was called to Holy Trinity and another period of expansion began. 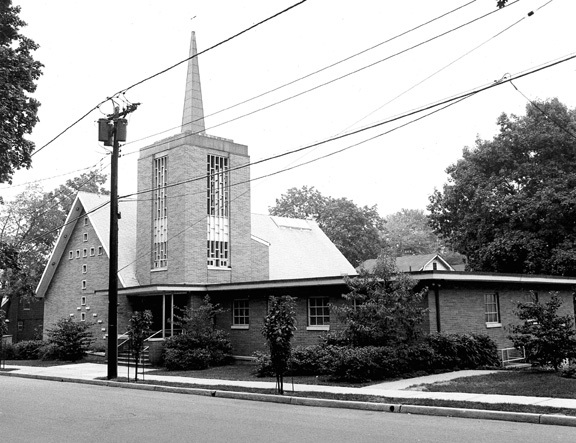 By the mid 1950s the growth of the congregation prompted the purchase of an additional parcel of property at Burton and Walter Avenues and a major building program commenced. A new parsonage was built in 1961, an education wing in 1962, and in 1963 the old church building was taken down and a new sanctuary and fellowship hall was built. They now owned all the property on the eastern side of Burton Avenue between Walter and Hamilton Avenues. Once again, they were able to celebrate the burning of their mortgage for all three structures in 1969. Throughout the 1960s, the entire community enjoyed Strawberry Festivals, which included a musical variety show, performed and hosted by the choir. Pastor Meiburg served at Holy Trinity for 31 years, and retired in the Spring of 1983. In July of 1984, the Rev. Dwight Shellaway was called to serve as Holy Trinitys new pastor until April of 1999. During his tenure at Holy Trinity they embarked on major renovations to make the facilities "barrier-free" including, among other changes, a ramp to access the facility and an elevator to go between floors. Pastor Shellaway also led the congregation in searching for ways to reach out to the community. For part of his stay in Hasbrouck Heights, he served as Chaplain of the Hasbrouck Heights Fire Department. In October of 2000, the congregation called the Rev. George Yoder who continues to lead the congregation today. They currently have a shared ministry with Zion Lutheran Church in Garfield. Under Pastor Yoders leadership, a Contemporary Service on Saturday evenings was established. Pastor Yoder also introduced the congregation to a Lutheran congregation in El Salvador, and Holy Trinity has been fortunate to be able to assist them in their ministry to the people in their community. Pastor Yoder and the organist, Omaldo Peréz, have introduced the congregation to a Taize service, currently held during Advent and Lent, and attended by members of Holy Trinity and other denominations in and around Hasbrouck Heights.  In the early 1980s, as part of the Hasbrouck Heights ecumenical effort, a Laotian refugee family was sponsored through Lutheran Refugee Services. -- REACH became a "by-product" of that effort, which remains a vital service to Hasbrouck Heights today.  Provided the seed money for the first thermal imaging camera for the Hasbrouck Heights Fire Department.  Became barrier free in 1990, not only for members, but for the community at large to be able to use the facilities. Organizations such as the Contemporary Club, the Womens Club, Girl Scouts, Boy Scouts, the public schools, etc., have all found a home at Holy Trinity at one time or another.  Continue to sponsor the Vacation Bible School for the community; an effort begun in the early 1960s.  Sponsored/hosted the first Hasbrouck Heights CROP Walk and continue to participate in the yearly event.  Prepare dinners for the homeless of Bergen County on a regular basis, the first one being held in the fellowship hall.  WELCA (Women of the Evangelical Lutheran Church in America) makes quilts for babies at Hackensack University Medical Center and also for Lutheran Social Ministries and Lutheran World Relief. The ladies also make health and school kits and collect box tops to support an American Indian reservation.  Sponsored the annual Ecumenical choral concert for many years. It has been an exciting 85 years, and Holy Trinity Lutheran Church looks forward to continuing its ministry and outreach for a long time to come. Holy Trinity welcomes all to join them in worship and learning opportunities. Call the church office at 201-288-6889 for information.